(NaturalNews) Why and how water is vital to our health The human body is about is 70% water. Newborns are roughly 80% water, and elderly are as little as 50% water. Our muscles are about 75% water. Even our bones, which seem completely solid, are 25% water. Without food, we would eventually die, but without water, we would die a lot sooner. Depending on the amount of fat and muscle in our bodies, most of us can live several weeks without food, 5-7 weeks on average. The average person can only survive 5 days without water. Undoubtedly, water is life. Our bodies use water to deliver oxygen and nutrients to every cell in the body and to remove waste and toxins from each cell. Water is a crucial component of our nervous system and an adequate supply is needed for our nervous system to send its signals. When dehydrated, even when mildly dehydrated, our joints are robbed of fluids. Do you ever suffer from back pain? If so, does your back hurt more in the morning? Many of us lose water throughout the night with nighttime bathroom runs and nightsweats. If we don't think to replace those fluids, dehydration results which inflames the kidneys, and this can cause back pain. Whenever your back hurts, try drinking several glasses of water. The pain usually subsides. This makes sense because the fluid inside the body's spinal discs supports 75% of the body's weight. "When the disks in your spine lack water, they begin to degenerate and herniate more quickly. It's similar to driving a car on underinflated tires. The tires will either wear out faster or eventually blow out." Don Colbert M.D. Water is the workhorse of our digestive system. Water is the primary part of all of our digestive fluids. Saliva, bile, stomach acid, pancreatic juices, and the mucus that lines our gastrointestinal tract are mostly water. Without adequate water intake the digestive system doesn't work, as it should. The mucous layer in our stomach is actually 98% water, and this is the best all natural protection against heartburn. The mucous layer contains bicarbonate, which effectively neutralizes stomach acid. When our bodies have adequate water, this mucous layer is thick, but when we do not, it is very thin. Contrary to popular belief, heartburn is not caused by an antacid deficiency, but rather it is usually caused by a water deficiency. Water is the most effective heartburn medication there is, and the cheapest, too. People who suffer from asthma and/or allergies typically have high histamine levels. Histamine forces the muscles in the bronchial tubes to constrict, which inhibits airflow through the lungs. Studies have shown that histamine levels drop as water intake increases. If you suffer from asthma or allergies "...water may improve your symptoms more than the latest round of inhalers or pills from pharmaceutical companies." Don Colbert M.D. Water is good for vascular health as well. Blood is more than 80% water. Adequate water intake can help to lower blood pressure, and it can play a part in preventing strokes and heart attacks. When we are dehydrated, our blood is thicker and more prone to clotting. Our brains, which are very sensitive to dehydration, are about 85% water. One of the easiest ways to improve brain function, especially your memory, is to increase water intake. Water also enhances immune system function. Common medical advice is to drink lots of water when we are sick, but if we drink adequate amounts of water all the time, we are less likely to get sick in the first place. Daily intake is dependent upon weight, climate, and activity level - roughly half a gallon to a gallon a day for a person weighing 150 lbs. Drink water past the point that you don't feel thirsty. 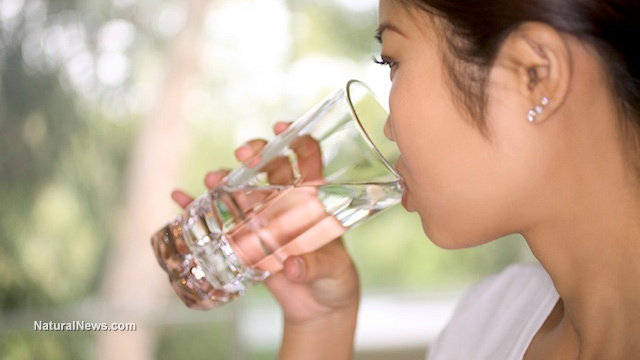 Many people drink other fluids instead of water. Although it is true that these drinks are mostly water, the caffeine, sugar or artificial flavors and colors put a strain on your body in various ways, and this can cost your body more water than what was consumed in the drink. For those who want to drink more water, but need flavors and sweetness, here's a recipe for cranberry lemonade that helps detoxify the body as well. If you're not consuming enough water, you're increasing the strain on your body, and accelerating the aging process. It is harder than most people think to drink too much water, and drinks that contain caffeine or sugar are very poor substitutes that rob the body of water (and minerals) with high acidity. There is no other substance that is as important to our health as water. For more on detoxifying, lowering blood pressure, and getting the most from water, check out the previous cranberry lemonade link, Hot & Cold Hydrotherapy, and the best water to detoxification. Water: For Health, For Healing, For Life by F. Batmanghelidj M.D. Seven Pillars of Health by Don Colbert M.D.